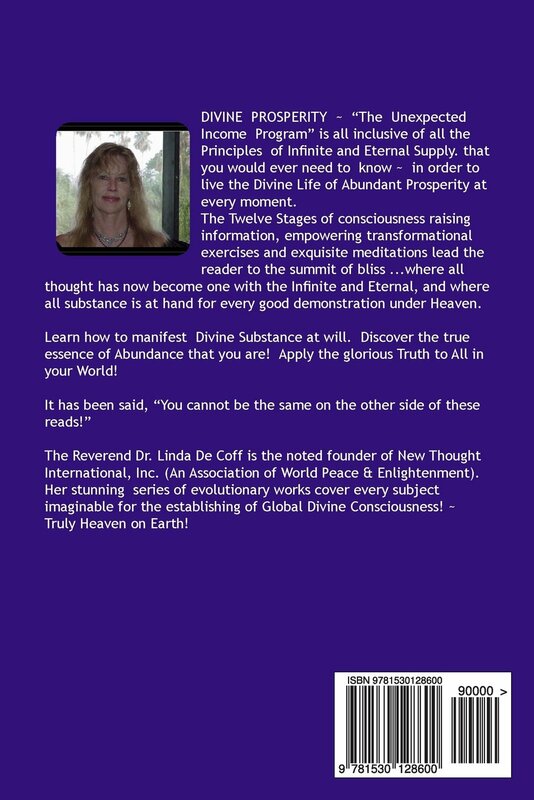 DEAR READER, It is our pleasure to announce the publication of Dr. Linda’s new book on DIVINE PROSPERITY. This wonderful in-depth book on the Highest Principles and Laws of Eternal Abundance Awareness includes extensive introductions on each Stage of Consciousness Ascension, along with deeply empowering consciousness raising exercises and daily meditations, to assist you in incorporating the vital information contained. With each step ~ such a transformation of consciousness is achieved that outer demonstrations in your world, reflective of your Higher State of Being, automatically occur. 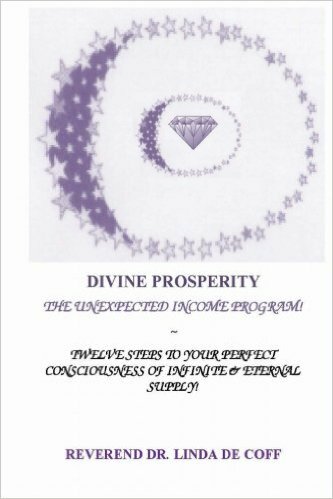 “The Unexpected Income Program” portion for each of the Twelve Steps provides all that you need to live at the Summit of Divine Thought eternally…and to get to the place, where you are so “One with all the Abundance that is” ~ that you are always demonstrating immediately the substance of everything you require. Expand your awareness, and rise to the summit of all bounty… Enjoy the Heavenly Mantras of each Lesson’s Theme, and the transformational exercises, allowing for your immediate transcendence of every troubling issue, along with the exquisite Daily Meditations for activating your Divine Consciousness within. Author Reverend Linda De Coff states at the beginning of the book, “If you are about to go into enormous change, or have just created enormous change, or are very much seeking to manifest an upgrade, over the past period of experience, this book is for you.” She couldn’t have described the book any better. Divine Prosperity is comprised of twelve stages, each of which builds on the previous stage or stages. Each chapter is followed by an “Instruction” or lesson that leads us through the building blocks necessary to personal prosperity, encouraging us to start with a clean slate, eliminate any erroneous beliefs, establish our worth and so on. Each chapter is also followed by a daily meditation. The lessons are invaluable, but they are enhanced by Reverend De Coff’s own personal experiences and those of friends and acquaintances, that are sprinkled throughout. As Linda says, the book will be of most benefit to those going through change or looking for an upgrade, but even if you are perfectly satisfied with your personal prosperity, the book will force you to think, remember what got you to where you are and remind you to continue along that path. Divine Prosperity is a 5-star read! 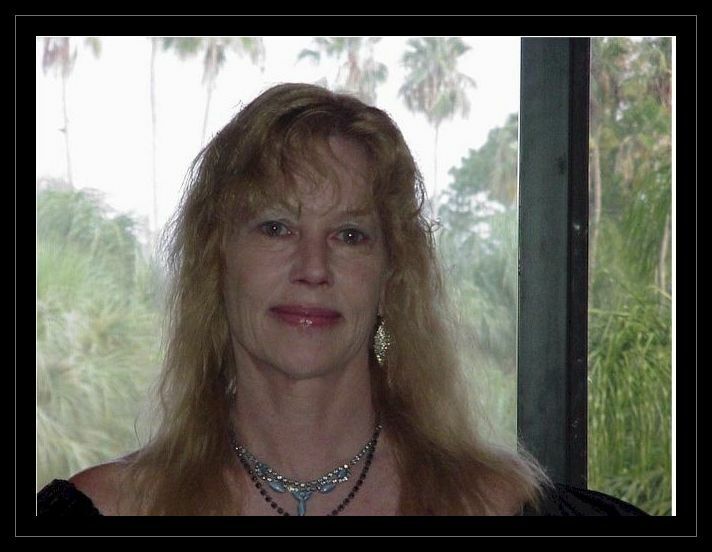 To hear recent radio interviews, where Dr. Linda was the featured guest of the day, speaking on her books, go to NEW THOUGHT INTERNATIONAL Library Radio Shows and/or to read ongoing articles on Higher Consciousness themes, visit https://www.revdrlindadecoff.com (see media and archive sections). I’m a huge fan of Rev. Dr. Linda DeCoff and just finished her last incredible work on Divine Romance & Perfect Partnership. What an easy-to-read, beautiful, transofrming work! Now looking forward to her latest Book on Prosperity, finally released!